It’s Popsicle Week 2017! Billy from Wit and Vinegar organizes this amazing virtual popsicle potluck every year, and I couldn’t be more excited to participate again. Billy is HILARIOUS and always shares the most eye-popping, fun stuff on his page. Check it out. So, here’s my minor popsicle conundrum. It seems like most of my popsicle recipes involve booze. 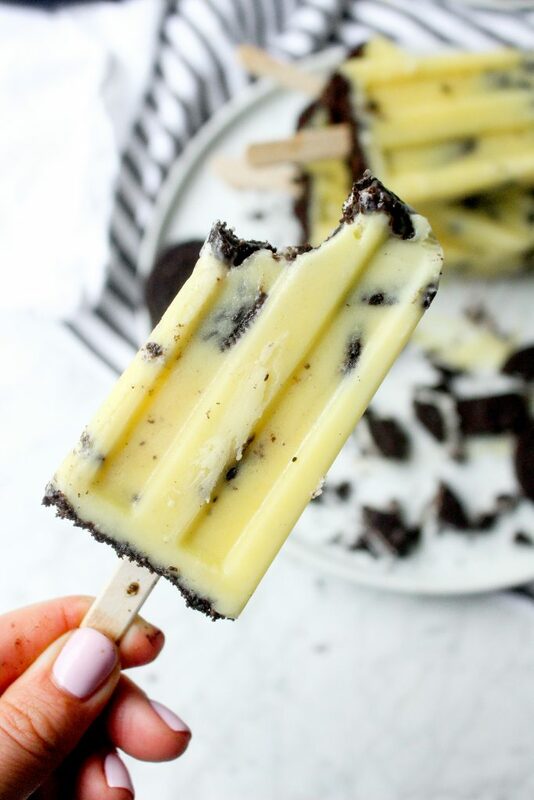 You would think with a toddler running around, I’d try to make some kid-friendly pops, but for some reason, Mama’s needs are continuing to come first with the popsicles. Shrug. Let’s not read too much into it, shall we? There’s something just so damn…fun about putting some alcohol in my popsicle. 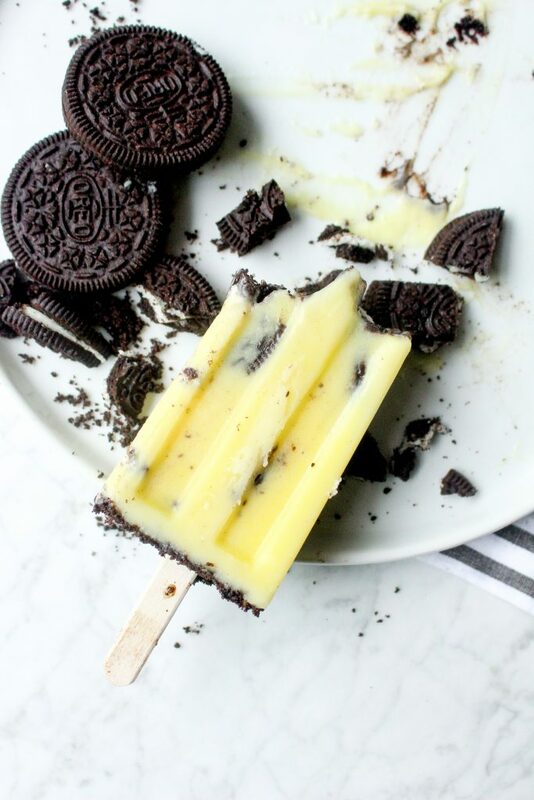 Popsicles are fun all on their own, of course, so adding a little somethin’-somethin’ to the mix makes it feel like partaaaay time. Not only are today’s cookies and cream popsicles boozy, they’re fantastically refreshing. AND! They come together with only four ingredients. These have to be the easiest popsicles I’ve made yet. It all starts with instant pudding mix. Yup. You read that right. It is not an ingredient that frequents my life at all, but in this case, it just makes life really, really simple. And I’m all about that these days. If you feel so inclined, go ahead and make vanilla pudding from scratch. You get extra kudos from me. The pudding mix gets whisked up with some cold milk (yes, it must be cold – makes the powder dissolve better and helps activate the gelatin!) and VODKA. I went with vanilla-flavored vodka because I really wanted to play up that flavor, but you can definitely use plain instead. Just don’t skip the vodka. Once the pudding is just mixed up, I toss in a bunch of crushed Oreo cookies. Because…YOLO. Freaking Oreos, man. They are so elfin’ good. I will never outgrow them. I NEVER (and I really mean that) buy Oreos. I can’t have them in the house. Dan and I can polish off an entire package in a matter of minutes, especially the Double Stuf ones. Good Lord. Give us a tall glass of cold milk and we go to TOWN. It’s scary. 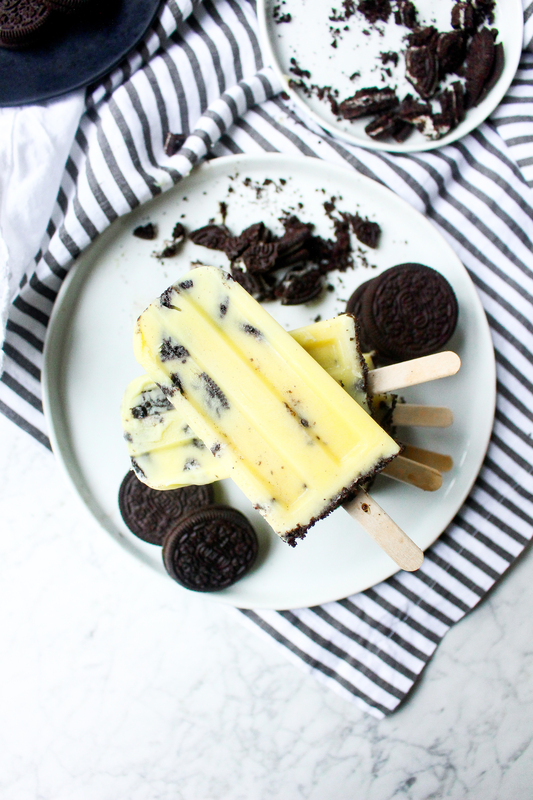 So, to prevent Oreo overdose, I only purchase Oreos for blog projects like this one. They are our kryptonite. The glorious cookies and cream mixture gets poured into popsicle molds and topped off with some more crushed Oreos. Into the freezer they go! OH, and in case you are wondering (because this question comes up every time I share a popsicle recipe), these are the popsicle molds I use. I’ve tried out several, and these are definitely my favorite. 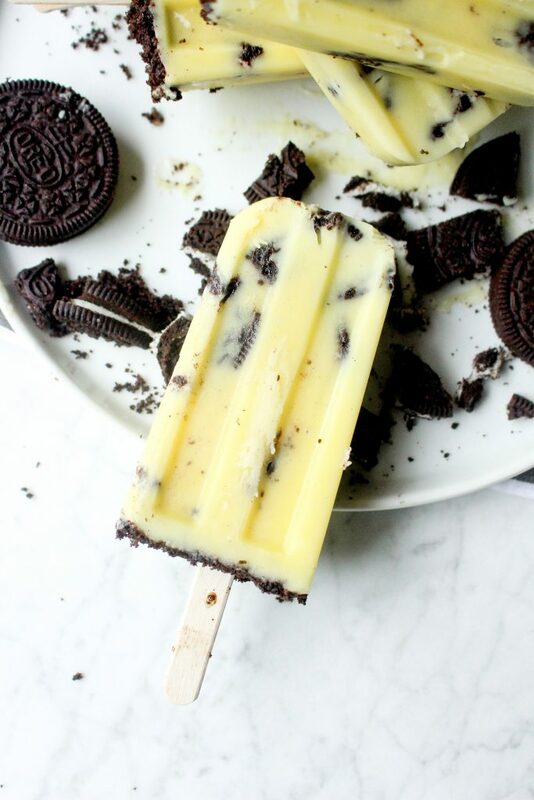 In just a couple hours, you get these insanely creamy, boozy COOKIES AND CREAM DREAM POPS. Ugh. They are so damn good. 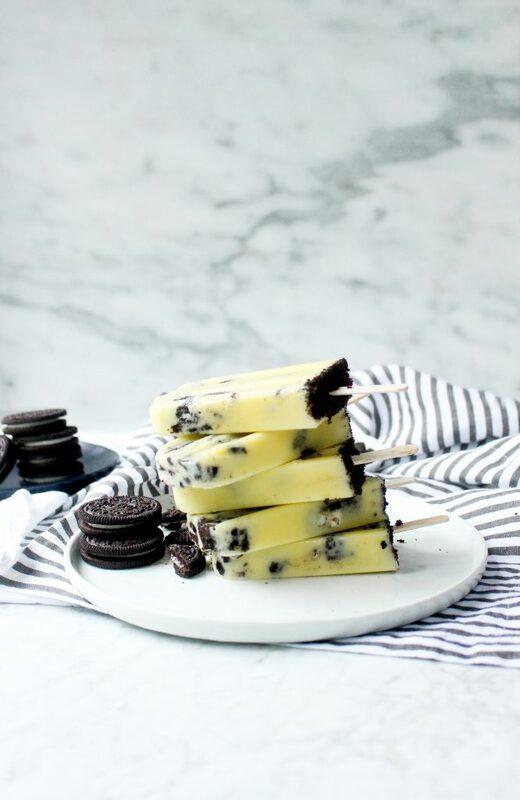 If you are a cookies and cream fan, these are meant to be in your life. Whisk together the pudding and milk until smooth. 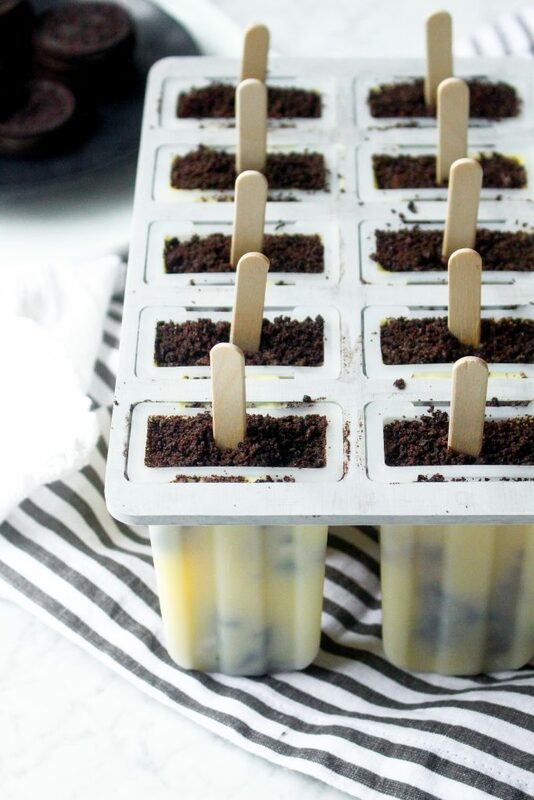 Finally, fold in the cookie crumbs, reserving some for the tops of the popsicles. 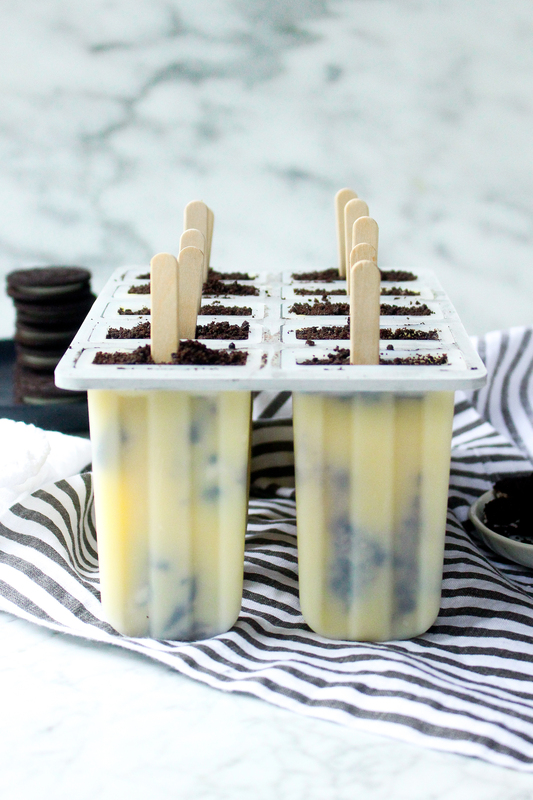 Pour the mixture into a popsicle mold, leaving half an inch of space at the top. Top each mold off with additional cookie crumbs. Freeze for 30 minutes, insert the popsicle sticks, and then freeze for another 3 hours. 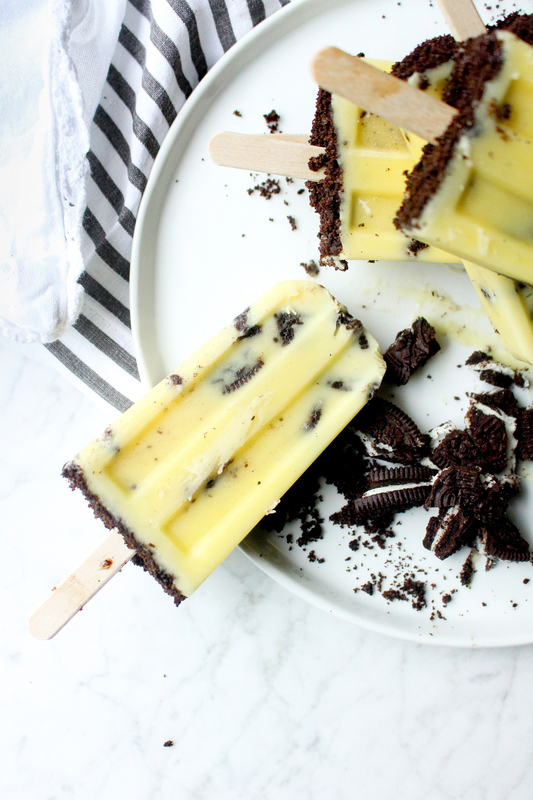 Unmold the popsicles by running the mold under lukewarm water for a few seconds.